I just wasn’t having good luck with the restaurants this weekend. R.U.B. BBQ co-owner Paul Kirk, the Kansas City “Baron of Barbecue,” is something of a legend in smoking and grilling circles, with over 475 cooking awards to his name, including seven “World Championship of BBQ” titles. On Sunday, B and I had our hearts (and stomachs) set on some of that Righteous Urban Barbecue, conveniently located next door to the Gotham Comedy Club on West 23rd Street where we would be attending our television taping that evening. We sat speechless for a bit, taking in how such a thing could be possible, and then tried another tack. Okay, what do you have? B asked for few minutes to consider that. In the meantime, could we get an order of the BBQ Chicken Wings? No doubt sensing the mood, our server hesitated before delivering the bad news. Actually, they were sold out of Chicken Wings. And Chili — hence, no Chili Cheese Fries… and lest we even thought to ask, Fried Green Tomatoes, too. That was the final straw. Check, please. 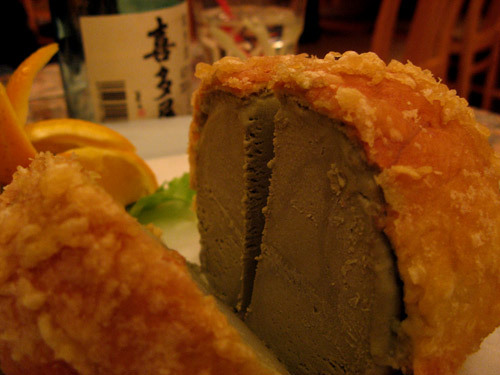 We decamped for nearby Monster Sushi, where nothing was sold out, and happily devoured a meal of sushi, sake and tempura green tea ice cream. After a chilly wait outside the Gotham, we were ushered inside the comedy club. 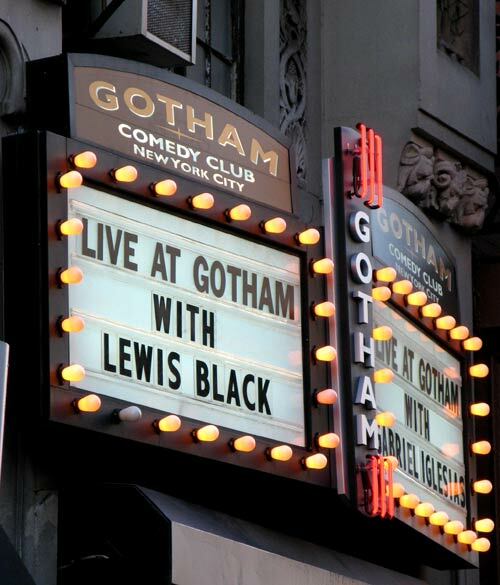 Tonight we were there to tape an installment of Comedy Central’s Live at Gotham, hosted by “America’s foremost commentator on everything,” Lewis Black. Black is a stand-up comedian, playwright, and author, but is probably best recognized for his regular “Back in Black” commentary segment on The Daily Show. After delivering his own performance, Black introduced a slate of half a dozen solidly fine and fiercely funny stand-up acts. It was good to laugh, and laugh we did. We were seated in the first row, right in front of the stage — the perfect vantage point for seeing and being seen. I’d like to attribute the optimal placement to our good looks, but more likely it was just good timing. We shared our table with a pair of young lovelies, and the ethnic/gender makeup of our fourtop did not escape the notice of the first comedian — an acid-tongued Buddy Holly lookalike — who seized upon it as fodder for his act. Ah, Mom will be so proud when this one airs on Comedy Central sometime this summer. I hate those racialist bastards.